Rosalind Russell (born Catherine Rosalind Russell; June 4, 1907 - November 28, 1976) was an American actress of stage and screen, known for her role as fast-talking newspaper reporter Hildy Johnson in the Howard Hawks screwball comedy His Girl Friday (1940), as well as for her portrayals of Mame Dennis in Auntie Mame (1958) and Rose in Gypsy (1962). A noted comedian, she won all five Golden Globes for which she was nominated and was tied with Meryl Streep for most wins until Streep won her sixth award in 2007. Russell won a Tony Award in 1953 for Best Performance by an Actress in a Musical for her portrayal of Ruth in the Broadway show Wonderful Town (a musical based on the film My Sister Eileen, in which she also starred). She was nominated for the Academy Award for Best Actress four times throughout her career. 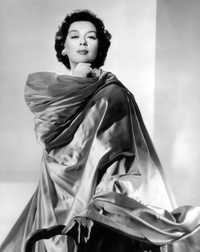 This webpage uses material from the Wikipedia article "Rosalind_Russell" and is licensed under the GNU Free Documentation License. Reality TV World is not responsible for any errors or omissions the Wikipedia article may contain.